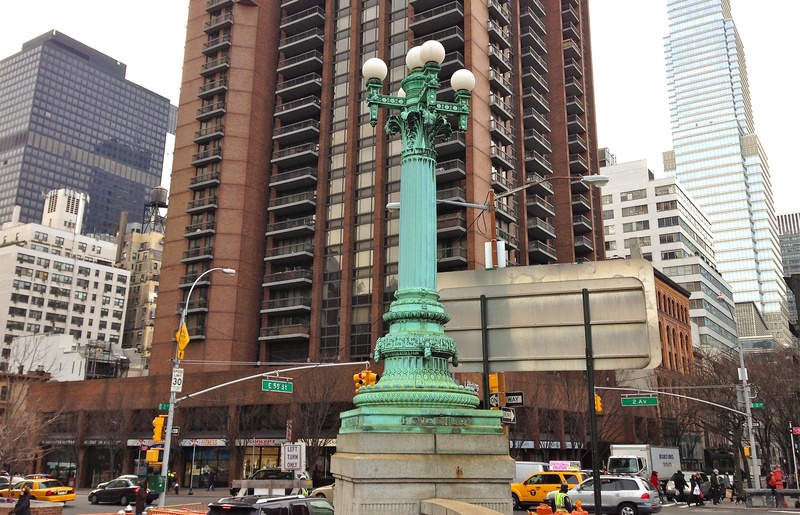 Right before the Manhattan-side entrance to the circa-1909 Queensboro Bridge is this beautiful bronze lamppost. On its base is a sweet touch: the names of four boroughs (sorry Staten Island) carved into it, symbolizing the recently united city. The lamppost no longer lights the way, but that’s okay. Just the fact that it managed to survive more than a century is a significant achievement. 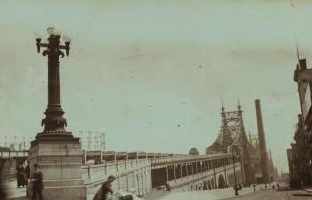 Here it is in a NYPL photo, left, dated 1910-1920. It used to have a twin on the other side of the bridge entrance. That lamppost vanished in the 1970s, but no one knew what had happened to it (theft? Moved to make way for the Roosevelt Island Tram? )—until it was found in a Department of Transportation signal yard in Queens last year. The Roosevelt Island Historical Society plans to restore it and display it there, next to a renovated trolley kiosk once part of the bridge. This entry was posted on January 7, 2013 at 6:38 am and is filed under Beekman/Turtle Bay, Music, art, theater, Queens, Transit. You can follow any responses to this entry through the RSS 2.0 feed. You can leave a response, or trackback from your own site. i believe the lip on the south side of the bridge is the old trolley path? it runs one way, from manhattan to queens, but behind you as you get on it, it descends into what then would have been the trolley station. Would you believe these lampposts were UPSIDE DOWN for many years? The lamp holders, that is. Not the pillars that supported them.